Steel Buildings represent the best of both worlds. Steel buildings are cost-effective, as you won’t have to spend a lot on their construction and maintenance. They are structurally sound, too, so you don’t have to worry about the unit collapsing due to a natural disaster. At least that’s what you can expect from new steel buildings. But can you expect the same from second-hand units? Second-hand steel buildings are gaining popularity, with more and more businesses choosing to purchase used units over new ones primarily because they are less expensive. 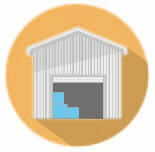 This is particularly evident in the agricultural sector, where steel-clad units are being reused as portal frame sheds. However, some people are sceptical about the performance of these buildings after years of use, plus the extent of repair or restoration they may require. If you’re considering a second-hand structure but are unsure if this is the right fit for your business, here’s a list of benefits and drawbacks to help you decide. If you want to find out more about the types of building that can be bought second-hand, simply continue reading this page. If you are ready to compare quotes today however, simply fill in the form at the top of this page. Comparing quotes with Approved Index is free, quick and easy, and it could save you as much as 40% on your used steel building purchase. Used steel buildings can be used in a variety of ways. For more information on each type, it is important to visit the appropriate page. However, if you are just interested in finding out which sectors or industries might be covered then the list below should be of use. If you you want compare quotes for used steel buildings today, just complete form at the top of this page. Less expensive. This one’s obvious as the lower price tag is what draws most companies to second-hand steel buildings in the first place. But how much exactly do you get to save by opting for used units? Estimates place cost savings at 25 percent. Quick purchase. With second-hand steel buildings, you can avoid the delays that usually result from fabrication problems as well as licence and permit issues. And as long as all necessary paperwork is in order and funds are available, the negotiation process won’t take long. Still sturdy and stable. A used unit may not perform at exactly the same level as a new steel building, but this doesn’t mean it’s not reliable. Older structures can still be sturdy and stable. Remember, second-hand is not synonymous with second-rate. You can find many good-quality units out there. Easy to assemble. 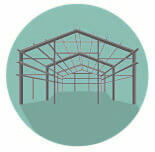 Components of second-hand steel buildings are often already numbered, making it easier to put everything together. Erection and layout drawings are usually included as well for additional guidance. Environmentally friendly. By purchasing used steel buildings, you are helping reduce your company’s carbon footprint, which your local planning office will surely be delighted to hear about. The steel sections of new structures, even with their 60 percent recycled content, have an environmental impact 25 times greater than reused steel sections. No quality assurance. There’s no way of knowing exactly how years of abuse from the elements have affected a second-hand steel building. It may appear solid and secure on the surface, but time could already have taken its toll on the structure. Rough spots. Used structures are likely to have rough spots. While some suppliers provide free respraying, shot blasting and alteration services to fix these, individual sellers will probably offer you the unit as it is. If there is any damage to the building, you might have to spend a substantial amount on the necessary repair. Roof and cladding limitations. 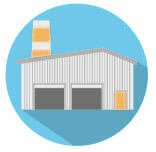 Second-hand steel buildings are not used widely in the commercial and industrial sectors, where structures require specific panel lengths and purlin spacing. Plus, most retail establishments need to look fresh and clean, which may be difficult to pull off in used structures, unless the cladding is completely restored to its original condition. Regulatory restrictions. There is a low probability of getting full regulatory approval for buildings made largely of re-used materials. As with any purchase, there are advantages and risks to buying second-hand steel buildings. Your safest bet is to consult an expert who can help you assess the structure’s condition and ensure that the asking price is reasonable. With careful consideration and a thorough review, a used unit could be a great deal. Steel constructions are among the best value options for those looking for resilient structures. If you are looking to save a little money, though, then a used or second-hand option is a good option. If you are looking at this option, then price may matter, Approved Index can help here - we will use your specifications and budgetary requirements to find you quotes from up to 4 UK suppliers. We do not charge for this servce and there is no obligation to purchase. It really is the best way to compare your options. Get your tailored steel building quote today by completing the quick and easy form at the top of this page. Let Approved Index help you find second-hand Steel Building suppliers today.